“So drink the coffee, eat some food and meet your neighbors where the ragged but right sit betwixt the keen politico, the suited baron, the gartered bishop, the productive co-ed and all ‘finer persons’ that should chance to enter.” Thank you Matt and Marc. Apt and succinct, this clever verbiage in the Anodyne’s front window perfectly sums up the five-year-old Brady Street fixture. If you wanna talk about your classic east side gathering places, all discussions must surely begin with the dearly departed Oriental Pharmacy lunch counter. (R.I.P.) When the “Big O” shuttered its plate glass double doors for good, the void it created was vast enough to resemble a black-hole. This wasn’t lost on Anodyne partners and childhood pals, Matt McClutchy and Marc Nikolic, who aspired to open a shop promoting a neighborhood feel — a place patrons could call home. Mission accomplished. In-house roasting, which McClutchy describes as a “mix of craft, art, and science, with a lot of nuance,” is a main calling card. You can practically taste the love in the liquid mojo they brew, and the two spend up to ten hours a day, five days a week, creating their blends. What isn’t sold in the shop is wholesaled to other restaurants and coffee venues. Not content to be just another coffee house with a few sandwich items and some store-bought pastry, Anodyne also makes their own guacamole, hummus, salsa, chili, tuna-salad, marinara sauce and olive spread. These and other homespun touches have yielded an impressive hard-core customer base. Local art livens the walls, and one particularly poignant painting of a silhouetted woman, coffee in hand, says it all. The inscription reads: “I have measured out my life in coffee cups.” It was an inspired token of appreciation from an Anodyne patron. 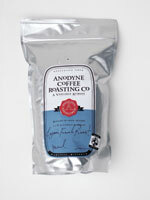 These days it’s getting hard to throw a rock without hitting a coffee shop, but Anodyne lives up to its meaning as a “soother of pain.” . . . . . . . . . . . . . . . . . . . . . . . . . . . . . . . . . . . . . . . . . . . . . . . . . The Brady Street Area Association is inviting neighbors to participate in the first Brady Street Neighborhood Garden Tour on Saturday, August 7. If you live in or near the Brady Street neighborhood and have a garden that you would like to show off, please call 298-9147 for a registration form and/or further information. When you return your form, the Brady Street Area Association will send you additional guidelines. Then your garden will be added to the tour map that will be given to all participants the day of the event. Some of the featured gardens will be hosting art by local artists. Additionally, the event will feature a perennial plant exchange and have some gardening experts present to answer questions in the registration area. The Marsupial Bridge Groundbreaking Celebration was scheduled to take place Thursday, May 27, at Lakefront Brewery.The bridge, which will provide pedestrian and bicycle access linking Brady Street to the trails on Commerce Street and Kilbourn Park, has been in the planning stages for some time. Construction had been delayed while its design was revised after bids came in higher than expected. There are two stairways linking the bridge to Holton Street. The bridge is designed by La Dallman Architects. The groundbreaking was to be Mayor Tom Barrett’s first official groundbreaking ceremony as Mayor.